Final specifications of the upcoming Huawei Honor V10 have surfaced, and the Chinese flagship looks to be one of the best in its space, for the year. On paper, at least. The Honor V10 is expected to be unveiled in China on November 28, then a week later in London. 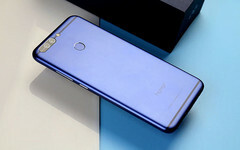 The Honor V series is essentially a refresh of Huawei's main Mate flagship line—the same can be said of the P series and the main Honor line, though—albeit with slight feature cuts to compensate for the significantly lower price tag. Our peers over at XDA-Developers laid hands on the V10's firmware over the course of the week, discovering a few valuable tidbits in the process. Information gleaned from the firmware file indicates that the V10 will sport a 5.99-inch FHD+, 18:9 LCD display. This seems to a tier lower than the QHD+ LCD panel used on the Mate 10, and the FHD+ AMOLED one used on the Mate 10 Pro, but it should serve just fine. On the flip side, the V9 featured a QHD display, so this is still a downgrade. The display is apparently manufactured by either TRULY, BOE, TIANMA, or CTC. Previous information, however, specifies a BOE-manufactured panel. The V10 will, of course, be powered by the same Kirin 970 used on the Mate 10 devices. It will, however, see a slight battery downgrade from 4000 mAh to 3750 mAh. It will feature the same 20 MP + 12 MP dual rear camera setup, albeit without the trappings of Leica lenses; and a 13 MP selfie shooter that's a slight upgrade on the 8 MP one on the Mate 10. Unlike the Mate 10 Pro, it will sport a 3.55 mm headphone jack, a feature that is quickly becoming a privilege on flagships. The Honor 8 was sold officially in the US but the Honor 9 wasn't, so we're not sure about the V10's potential availability in the US. The Mate 10 Pro will be sold under AT&T as the first step in a partnership between Huawei and the American telecommunications company, however, so there's a chance the V10 gets the same treatment. Being available in the US would give it the platform it needs to trade proper blows with other flagships that have been released this year—a fight we expect it to gain a semblance of an advantage in. Most of the other flagships have dropped the ball in a number of departments: The displays of the Pixel 2 XL and LG V30, the OnePlus 5's numerous shenanigans, the Essential PH-1's poor camera, the HTC U11's lack of a headphone jack, and Moto Z2 Force's obstinacy and unaccommodating price tag. At the end of the day, the only flagships without any major issues are the Pixel 2, and Samsung's offerings for the year, but the Note 8 goes for almost twice of the V10's expected MSRP—US$450—so that leaves just the S8 and Google's smaller-sized device. This is all just conjecture, we admit, as the appraisal of a smartphone by its spec sheet may be a pointless endeavor; Huawei may mess things up—they've been known to. But in the battle of spec sheets, the Honor V10 indubitably sits at the head of the table. Or close to the head, in any case. We'll find out in ten days.